1. Environmental protection and energy saving, no pollution. No any poisonous or harmful gas. 2. Demould easily. 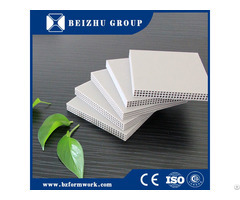 No need brushing release agent, only tapping, the formwork will fall off. Shorten working hours and speed up the construction schedule efficiently. 3. Easy to process. Sawing, drilling and nailing are all available. Formworks can be combined vertically and horizontally optionally. The reusable time can reach more than 60 times, long service life. 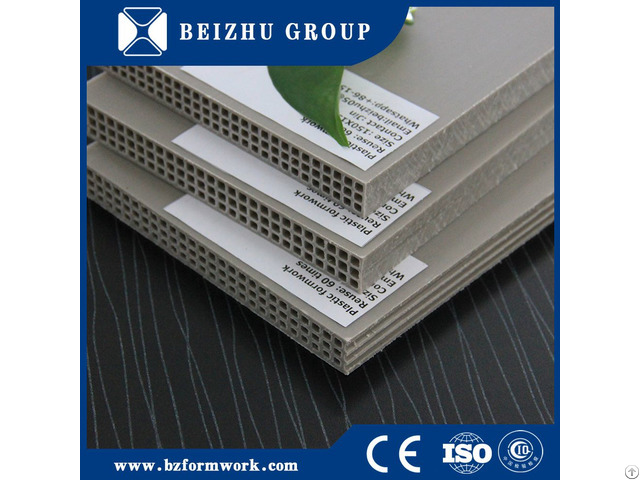 Business Description: Beizhu group was founded in 1988, is located in Taiyuan City, Shanxi Province, is a manufacturer of plastic construction formwork and gypsum board. Covering area is about 12000 square meters, with more than 500 employees, is one of the largest manufacturers of China construction material. 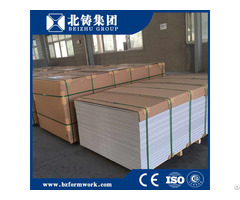 Our company is mainly engaged in the production and sale of plastic construction formwork and gypsum board .Our company establish good cooperation relationship with 300 large national construction enterprises, real estate development company ,and construction, decorate, packing enterprises .Our company always pursue the concept of quality casting value and adopted the Certificate of ISO9001:2008 International Quality Management System. Since our inception, company has been adhering to the quality first, the user is responsible for, let the user satisfaction service tenet, by expand the domestic and international market, and provide superior plastic construction formwork and wholehearted service for the customers both at home and abroad. Beizhu Group is a high and new technology enterprise which set R&D production and marketing services in one.